Last week IBEC attended the third edition of “IN(3D)USTRY: From Needs to Solutions”, the international meeting devoted to 3D printing. The institute had a stand in the exhibition area, where Head of Technology Transfer Xavier Rubies and Technology Transfer manager Xavier Puñet welcomed visitors interested in finding out more about IBEC’s 3D bioprinting capabilities. The Generalitat de Catalunya’s Minister of Enterprise and Knowledge, Àngels Chacón (right), was interested to hear about IBEC’s medical solutions using 3D bioprinting for bone, cartilage, skin, diagnostic, cardiology and muscle. This year was the first year that IBEC took part in the ‘Bojos’ initiative, with a course devoted to bioengineering. 25 students have been coming to IBEC on eighteen Saturdays between January and October to attend in theoretical and practical sessions about the main areas of research in bioengineering applied to health: controlled drug release, biomaterials, regenerative therapies and the medicine of the future, among other topics. In addition, the students participated in complementary workshops where they looked at ethical questions and scientific communication, as well as getting hands-on experience of the research laboratory environment. 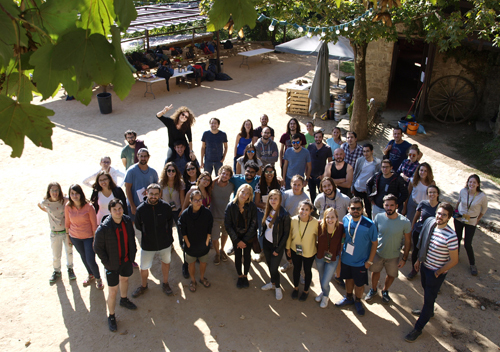 Last week IBEC’s PhD students headed off to Mas Colltort in Sant Feliu de Pallarols for the first ever IBEC PhD retreat. The two-day sojourn in the country was a chance for more than 50 of IBEC’s students to hear talks by various speakers, give flash presentations about their career paths, and get to know one another. Yesterday’s 11th IBEC Symposium closed with the bestowing of IBEC Doctoral Certificates of Excellence on two PhD fellows, the first time the recognition has been awarded since the initiative’s inception in 2017. 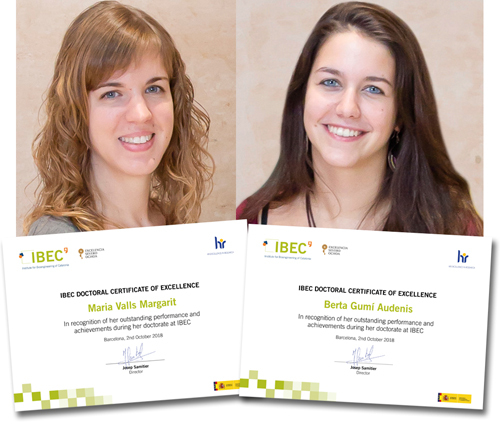 Maria Valls from the Biomimetic Systems for Cell Engineering group and Berta Gumi from Nanoprobes and Nanoswitches were the students who achieved the certificates, which are in recognition of outstanding performance during the PhD at IBEC. Tueday 2nd October will see the Institute for Bioengineering of Catalonia’s 11th Annual Symposium take place at Barcelona’s AXA Auditoritum, the first symposium in the insitute’s second decade of activity. 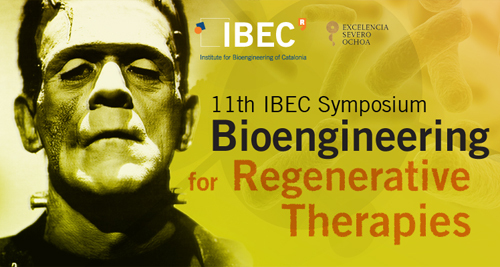 Focusing this year on the topic of Bioengineering for Regenerative Therapies – one of IBEC’s three areas of application, with its expertise in 3D bioprinting, biomaterials, nanomedicine, stem cells and biomechanics – the symposium will welcome expert speakers in tissue engineering and regeneration from all over the world. 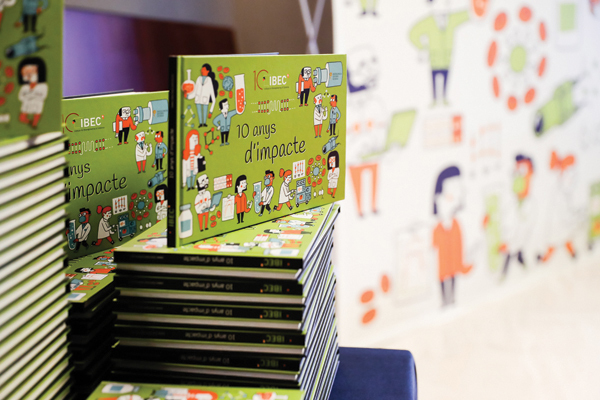 Artist Miguel Bustos was a finalist in a prestigious illustration prize for his work last year on IBEC’s Anniversary Book, ’10 anys d’impacte’. The 16th edition of the Premis Junceda of the Associació Professional d’il·lustradors de Catalunya saw Miguel up against four other finalists for a prize in the ‘non-fiction book for adults or children’ section. The jury of illustrators is made up of winners of previous calls and personalities from the world of visual communication. 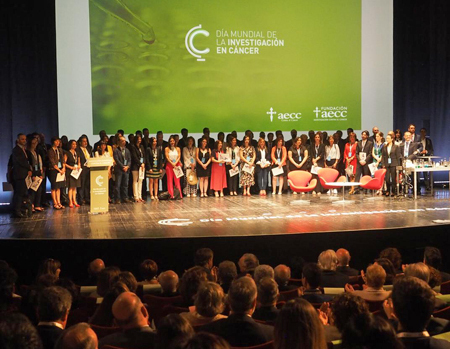 On Monday IBEC junior group leader Nuria Montserrat and senior researcher Aranzazu Villasante were two of the researchers awarded funding at the Asociación Española de Investigación sobre el Cáncer (AECC)’s ceremony in Madrid. The AECC has bestowed 160 grants on cancer researchers during the past year, a total of €17.6m. The association made the official presentations of these awards at an event presided over by Her Majesty Queen Letizia on World Cancer Research Day, 24th September 2018. A University of Barcelona master programme in which IBEC participates has been awarded the EIT Label, a certificate of quality for master and doctoral programmes, from EIT Health. 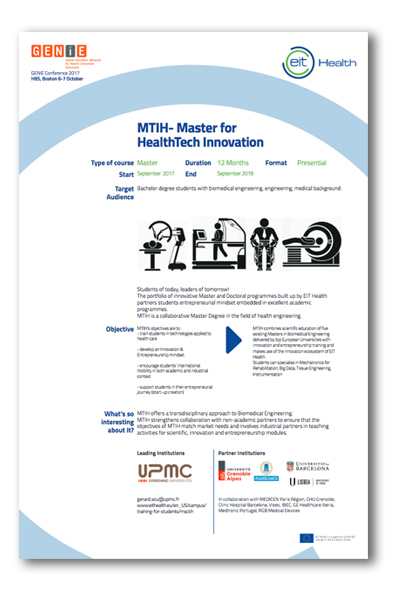 The Master of Technological Innovation in Health (MTIH), led by Sorbonne University, has achieved the EIT Label for its excellent scientific education coupled with innovation and entrepreneurship training. IBEC’s role in the degree programme includes the active participation of students, as well as the innovative technology for health being developed by IBEC’s researchers, many of whom teach on the programme. 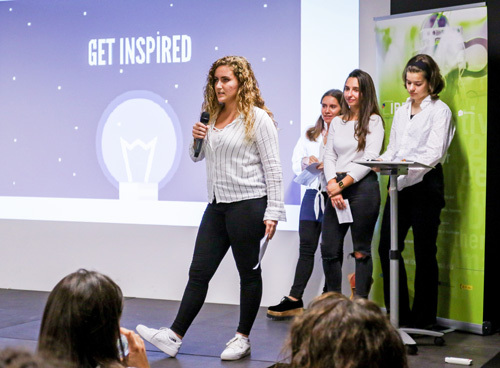 Implemented by a consortium of five universities in France, Spain and Portugal, the MTIH provides ‘active learning’ methods and supports student mobility, and new teaching content is being added to strengthen students’ innovation and entrepreneurship expertise. 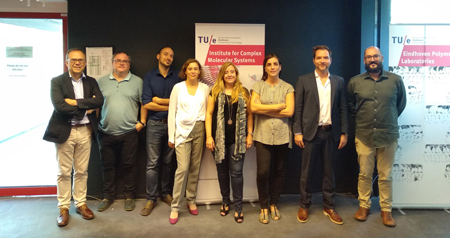 The event aimed to identify synergies and potential for collaboration between IBEC groups and the researchers of the Institute for Complex Molecular Systems (ICMS), a research institute of the Eindhoven University of Technology (TU/e). Two IBEC group leaders, Vito Conte and Lorenzo Albertazzi, already have dual appointments with ICMS. They opened the symposium by welcoming all participants from the two institutions and presented their research, as did Eduard Torrents, Elena Martinez, Silvia Muro, Nuria Montserrat, Samuel Sanchez and director Josep Samitier, who also introduced IBEC. 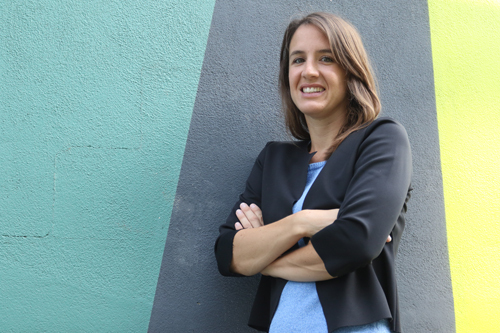 Benedetta has come from Barcelona’s Centre for Genomic Regulation, where she was a postdoc in Ben Lehner’s and Gian Gaetano Tartaglia’s groups. At IBEC she will launch and lead the Protein Phase Transitions in Health and Disease group. During her postdoc, Benedetta focused on why certain genes are toxic when over-expressed. She found that, in some cases, they cause toxicity because the proteins they code for end up forming a different liquid phase in the cytoplasm.